Chevrolet‘s “Confessions of Corporate Spies” campaign in the United Arab Emirates has won the Media Grand Prix at the 2010 Dubai Lynx Awards. Hiroshi and Osamu, spies for a Japanese company, are sent to the Middle East to find out why Chevrolet cars are so popular. They discover and report back on the four key areas in which Chevrolet excels: low cost of ownership, peace of mind, safety, and quality, reliability, durability (QRD). 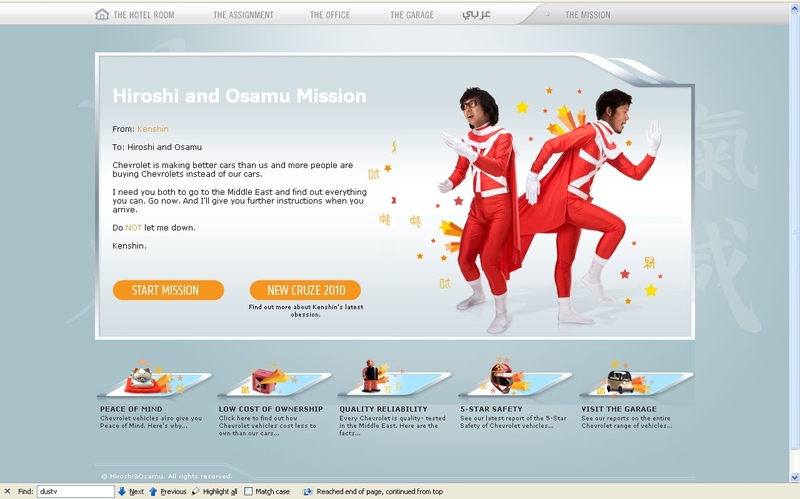 Fans were able to follow the progress of the two spies on their web site, www.hiroshiandosamu.com, television commercials and print advertising, Facebook (over 25,000 fans) and Twitter (@hiroshi and @O5amu. Hiroshi and Osamu were caught on CCTV at a Chevrolet showroom, and a first-in-the-region WebTV series was produced and broadcasted through the leading TV station’s Video on Demand platform (MBC.Net/HO) over 8-weeks. H&O became stars and featured on magazine covers. One of their loyal university friends captured their story in a manga-style comic. Media was placed by Starcom Mediavest Group, Dubai, by Digital Program general manager Rayan Karaky, media director Manikandan Hari, media manager Ali Nehme, branded entertainment consultant Wael Hattar, media supervisor Rommel Guiang, media executives Maria Fernandes and Joubran Abdulkhalek, junior consultant Muna Abudayyeh, media supervisor Mazen Haddad, media manager Vinod Kumar, adminstrators Allan Guevara and Richard Viray.